When you’ve been part of the racing industry for a long time it’s easy to forget the sport can be difficult break into. Where do I buy tickets? How can I become a member? What should I wear? When is the best time to go? Most people are introduced to racing by friends or family but those who don’t have anyone to lead the way will likely spend their time and money elsewhere. Enter Young Professionals in Racing, YPR for short, a social group dedicated to fostering the next generation of racing participants. It connects existing fans and provides a stepping stone into thoroughbred horse racing for newcomers. YPR hosts race day events for members at Australian Turf Club venues, overnight trips to country tracks, stable tours and punting previews as well as other functions that appeal to young professionals. Sydney trainer Chris Waller, his executives Sophie Baker and Liam Prior and YPR Directors Brad Druitt, Julieanne Horsman, Patrick Galloway and Jared Goodwin. Photo credit: Oscar Colman. 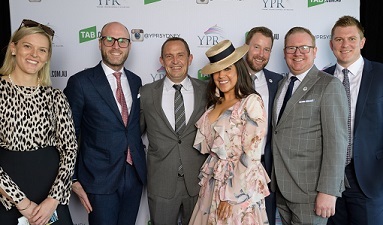 YPR is a not for profit organisation supported by several generous sponsors including the TAB, Racing NSW, Bowermans Office Furniture, Grant Bloodstock, Dapper & Doll and Tailor and Co. This allows YPR to subsidize its events making it more attractive for first timers to come along and experience the races. YPR members pay $100 per major racing season (Spring and Autumn) and are then invited to attend all YPR race day events free of charge. They get more than their money’s worth if they attend just one event. Although most members are aged under 35, YPR doesn’t discriminate against the young at heart. You don’t have to be a professional in the traditional sense either. People from all walks of life are welcome. 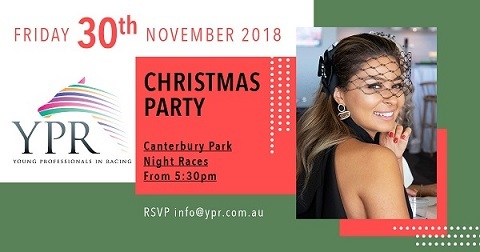 YPR is hosting its final event for 2018 at Canterbury Night Races on Friday, 30th November. Guests will enjoy canapes, drinks and eight local races as the sun goes down. There will also be a DJ, TAB’s virtual reality race game and plenty of giveaways. This event is free for YPR members and you must be a YPR member to attend. Those wishing to join YPR can take advantage of a special offer. Pay $100 for Summer/Autumn 2019 YPR membership (valid until 30th June 2019) and get the rest of 2018 including the Christmas Party as a bonus. Sign up online here. The Christmas Party caps off a successful year for YPR which included four individual race day functions at Royal Randwick and Rosehill Gardens, a joint Autumn Carnival party with the Australian Turf Club’s Young Members, a tour of Inglis’ new Riverside complex, a networking night and a professional headshot night. Among the guest speakers at those events were leading Sydney trainers Chris Waller, Adrian Bott and Bjorn Baker, TAB Everest slot holder Max Whitby, and Redzel’s part owners Peter Piras and Timothy Cheng. NRL star Robbie Farah, Rugby League Commentator Jamie Soward, The Edge 96.1fm host Emma Chow, Channel 9 Reporter Julie Snook and actor Hugo Johnstone-Burt also attended YPR functions during the year.